Just like their Wool Clasica and Cotton Stria, the Merino Silk is kettle-dyed by hand to create deep, vibrant solids and variegates. Completely different from the Wool Clasica, the Merino Silk is soft enough to be used in baby garments. As much as I loved the Manos Wool Clasica to look at, knitting with it left something to be desired. For me, anyway. I know The Blogger has a deep and abiding love of Manos Clasica for felting and outwear garments. Aside from the fact that the Merino Silk is softer than it’s older siblings, it has the added benefit of being DK weight instead of worsted. While it comes in 50 g hanks and not 100g (like Clasica), they have the same yardage for nearly the same price. The only drawback I could see is that the Merino Silk is millspun, not handspun like one might expect, which is probably why it costs less than the Clasica. Back to receiving the Silk Blend. This variegate, “Autumn”, immediately caught my eye. So, as soon as it was received, i.e. in the system and ready for sale, I grabbed a hank and CO for a hat. With 150 yards to 50g and a cold head, the project choice seemed obvious. On US 5’s, with 5.5 sts & 8 rows/ inch, I CO 120 sts for my 23″ head (remember to always subtract 10% for negative ease!). 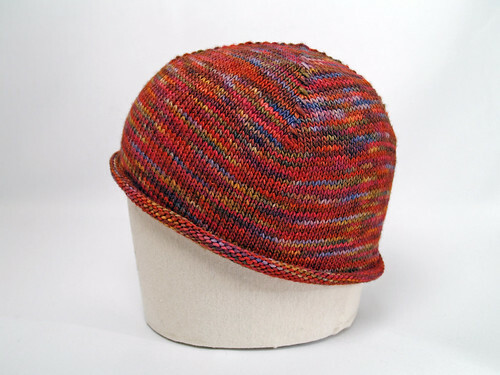 Enjoying the process of just knitting with the yarn, I worked the hat in stockinette for several inches. The yarn made a soft, well-draping fabric. It was hard not to stop and admire the color-changes in the yarn every row or so, I must admit. Eventually, though, I had to start the crown decreases, which The Blogger cunningly took an aerial-view photo of. My first worry was that the yarn might pool unattractively once the number of sts changed. Thankfully, the way the yarn is dyed seems to prevent this. As you can see, the yarn didn’t stripe either (another problem I find with some hand-painted yarns). In the end, I finished with some yarn to spare. Not much, but enough to prevent panic. After an experimental “sqoosh” or two, I put it back on my head. What can I say? I like my hat. I also really like the yarn. It was a pleasure to knit with, and I definitely want to use it again in the future. Aside from hats, it would be great for baby clothes, mitt(en)s and scarves. In the pattern book that came with the yarn, Primera, there are also several gorgeous adult sweaters I might be tempted to try. This just might be my new favorite yarn for next winter. Next week: how do you knit a pineapple? The post True Plies: A Cheap Thrill appeared first on Knit Purl Blog.